Roti is generally a South Asian bread made from stoneground wholemeal flour, traditionally known as atta flour, that originated and is consumed in India, Pakistan, Bangladesh, Nepal, and Sri Lanka. Roti and its thinner variant, known as chapati, are an integral part of Indian and Pakistani cuisine. Roti is generally a South Asian bread made from stoneground wholemeal flour, traditionally known as atta flour, that originated and is consumed in India, Pakistan, Bangladesh, Nepal, and Sri Lanka. In a large mixing bowl, mix Chapati Flour and Salt well. Add Oil and mix until all lumps are gone. Add Warm Water a little at a time to form a medium soft dough ball. Do not overwork the dough. Add few drops of Oil and coat the dough ball. Cover and let it rest for 15 minutes. Heat tawa or skillet on medium heat. Knead the dough once and divide into golf ball size balls. Dip one ball into the All-purpose flour to coat and roll it out into a thin disc. 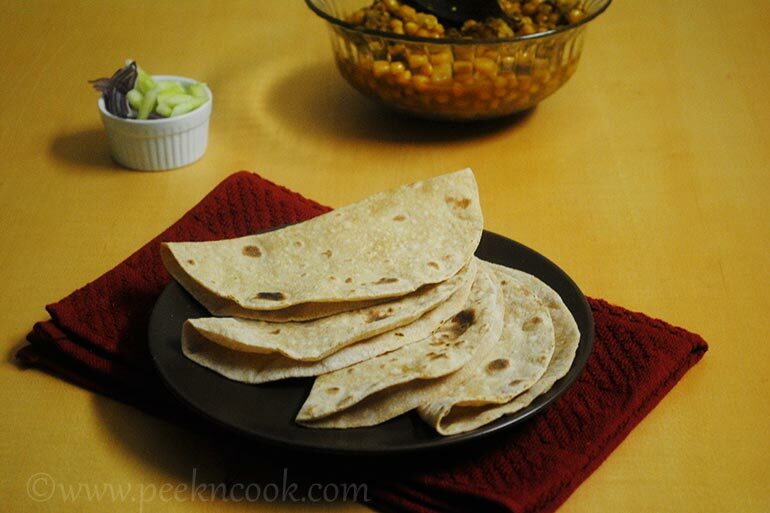 Keep dipping the roti into the dry flour to prevent it from sticking to the rolling surface. Shake or rub off excess flour from the roti and place it onto the hot tawa. Flip to the other side once you see bubbles appear on the surface. Allow it to cook for 10-15 seconds. Increase the stove heat to High, gently pick the roti up with tongs, remove the tawa off of the flame, flip the roti over and place onto an open flame. The roti should balloon up. Flip it over and cook on the other side. Place the cooked roti into an insulated container and smear it with Ghee or clarified butter and repeat the process for the remaining dough. Serve hot with any kind of veg or non veg curries.